Unwind after a long day with a full-body massage in the comfort of your own home. Convert any space into your own personal relaxation room. Relax your body with the popular zero-gravity function that removes pressure to the lower back. Take advantage of built-in body scan technology to automatically detect the shape of your spine and provide a massage that is customized for your body. Experience multiple massage techniques including kneading, shiatsu, pressing, knocking, and tapping. Six rollers and strategically placed compression airbags provide you with comfort and relief. Use the foot massage function to unwind and alleviate aches. Imagine coming home from a long day and enjoying a professional quality massage right in the comfort of your own home. Say goodbye to traveling far distances and scheduling appointments, it’s like having a massage therapist on call, waiting for you. Sit back, relax, and enjoy a full-body massage. Stress and discomfort can happen at any time. Looking at a screen strains your neck, extended periods of sitting in a car or at a desk causes back discomfort, and your feet accumulate aches from constant standing and walking. Stop resigning yourself to live with discomfort. Regular massage therapy is great for reducing stress and easing discomfort. Make the decision to change your life for the better. The InstaShiatsu+™ MC-1000 is designed with body scan technolv5ogy that automatically detects the position of your body and the shape of your spine, while identifying areas of tension to provide a massage that is customized for your body. Enjoy a foot massage that targets specific pressure points to alleviate aches and ease pain. Use the compression airbags to gently grip and stretch your arms and hands. 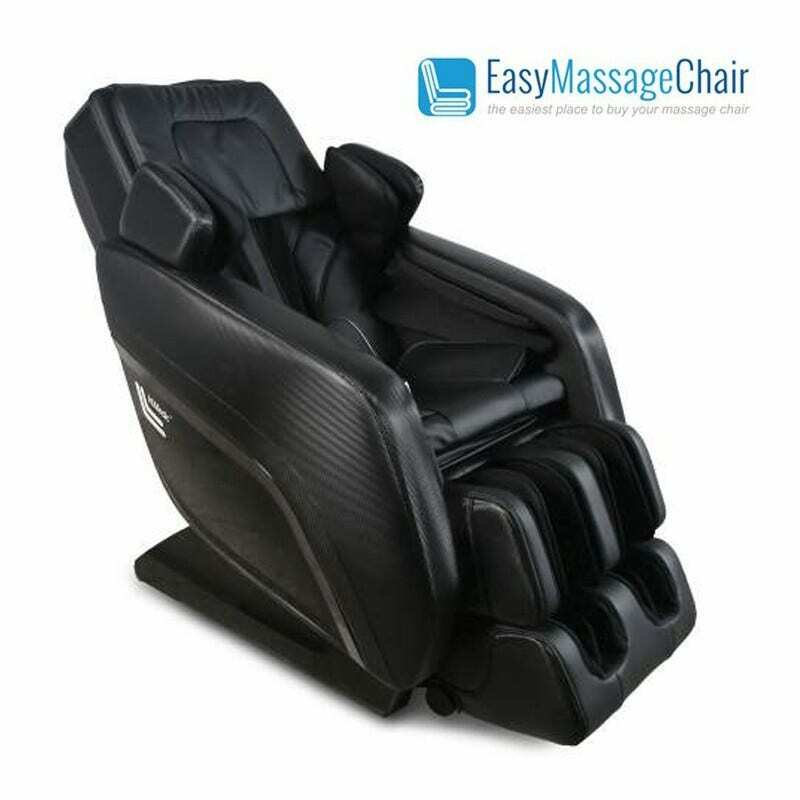 Shift the seat, backrest, and leg rest to find your perfect position for relaxation. It's like having your own personal massage therapist. Relax with a deep-kneading shiatsu massage any time you need it. You'll notice a positive impact immediately. Recommended Height Range 5" - 6'4"
This item includes a 2 year limited warranty from the manufacturer. truMedic® warrants this truMedic® InstaShiatsu+Massage Chair against defects in materials and/or workmanship under normal use for a period of TWO (2) YEAR from the date of purchase by the original purchaser (“Warranty Period”). Normal use is defined as use by an end-user in a residential location. If a defect arises and a valid claim is received within the Warranty Period, at its option, truMedic® will either 1) repair the defect at no charge, using new or refurbished replacement parts, or 2) replace the truMedic® InstaShiatsu+Massage Chair with a new or refurbished truMedic® InstaShiatsu+Massage Chair OR 3) provide a credit in the amount of the purchase price of the original product. A replacement product or part, including a user-installable part installed in accordance with instructions provided by truMedic®, will be covered for the remaining warranty period of the original product. When a product or part is exchanged, any replacement item becomes your property and the replaced item becomes truMedic’s property. When a credit is given, the original product must be returned to truMedic® andbecomes truMedic’s property. Obtaining Service: To obtain warranty service, call truMedic’s Warranty Service at 888-264-1766 or contact the company via email at service@truMedic.com. Please be prepared to describe the truMedic® InstaShiatsu+Massage Chair model that needs service and the nature of the problem. Proof of purchase is required. All repairs and replacements must be authorized in advance. Service options, parts availability and response times will vary. Limits and Exclusions: Coverage under this Warranty is limited to the United States of America, excluding the U.S. Territories of Guam, Puerto Rico, and the U.S. Virgin Islands and including Canada. This Warranty applies only to products manufactured by truMedic® that can be identified by the “truMedic®” trademark, trade name, or logo affixed to them or their packaging. The Warranty does not apply to any non-truMedic products. truMedic®, in so far as permitted by law, provides these products “as is.” This warranty does not apply to: a) damage caused by failure to follow instructions relating toproduct’s use or the installation of components; b) damage caused by accident, abuse, misuse, fire, floods, earthquake or other external causes; c) damage caused by serviceperformed by anyone who is not a representative of truMedic; d) accessories used in conjunction with a covered product; e) a product or part that has been modified to alter functionality or capability; f) items intended to be periodically replaced by the purchaser during the normal life of the product including, without limitation, batteries or light bulbs; g) any product sold “as is” including, without limitation, floor demonstration models and refurbished items; or h) a product that is used commercially or for a commercial purpose. TRUMEDIC SHALL NOT BE LIABLE FOR INCIDENTAL OR CONSEQUENTIAL DAMAGES RESULTING FROM THE USE OF THIS PRODUCT, OR ARISING OUT OF ANY BREACH OF THIS WARRANTY. TO THE EXTENT PERMITTED BY APPLICABLE LAW, TRUMEDIC DISCLAIMS ANY AND ALL STATUTORY OR IMPLIED WARRANTIES, INCLUDING, WITHOUT LIMITATION, WARRANTIES OF MERCHANTABILITY, FITNESS FOR A PARTICULAR PURPOSE AND WARRANTIES AGAINST HIDDEN OR LATENT DEFECTS. IF TRUMEDIC CANNOT LAWFULLY DISCLAIM STATUTORY OR IMPLIED WARRANTIES, THEN TO THE EXTENT PERMITTED BY LAW, ALL SUCH WARRANTIES SHALL BE LIMITED IN DURATION TO THE DURATION OF THIS EXPRESS WARRANTY. Some states disallow the exclusion or limitation of incidental or consequential damages or how long an implied warranty lasts, so the above exclusions or limitations may not apply to you. Thiswarranty gives you specific legal rights and you may also have other rights, which vary from state to state.